This very exclusive upscale circle island tour focuses more on sightseeing than any of our other tours. Stopping at Oahu’s most scenic, famous and exotic spots, this tour is perfect for people who want to experience the whole island in a day. Throughout this journey you will be engaged with legends and historical culture of Hawaii through your navigator along the way. Learning things from our highly experienced local navigators is the key to an enriched guided journey. Enjoy fascinating storytelling and captivating tales of Hawaii’s perpetuating history with expert insight. Explore an exuberated Hawaii, from native plants (na mea kanu) and animals (holoholona) to the historic events of Hawaiian Royalty (Na Ali’i O Hawai’i). This journey will offer you the best scenic views and cultural flavors Oahu has to offer! 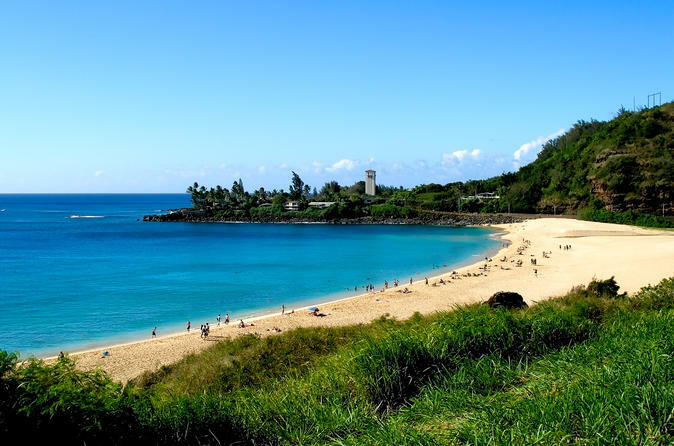 Explore famous North Shore beaches like Waimea Bay and Sunset Beach, where the all-star professionals and local surfers come to show off their talents. Enlighten your vacation with a trip to the world famous Dole Pineapple Plantation to ride the “Pineapple Express” train, and Tropical Macadamia Nut Farm, offering an abundance of Hawaii’s delightful treats and gifts! Additionally, you will also enjoy an exclusive canoe ride around the Polynesian Cultural Center (Not open on Sundays) and a delicious lunch and hula presentation. Our navigators will uncover the myths behind Oahu’s most beautiful scenic locations, including the Nu'uanu Pali Lookout. Enjoy impressive photo opportunities as you circle from Oahu’s North Shore and South Shore, visiting beautiful sightseeing spots along the way. View picturesque offshore islands like Chinaman’s Hat and Rabbit Island.